An article to be published in the “Astrophysical Journal Letters” reports the discovery of the exoplanet HD 39091c, the first identified thanks to NASA’s TESS space telescope. It’s a super-Earth with a radius of 2.14 ± 0.04 the Earth’s and a mass estimated at 4.82 ± 0.85 the Earth’s. It’s very close to its star, which is a little larger than the Sun, with a year that lasts just over 6 Earth days. Launched on April 18, 2018, the TESS space telescope began its scientific operations in search of the tiny traces of planets passing in front of their stars on July 25. Among the first targets of its observations there’s the star HD 39091, also known as Pi Mensae and other catalog names as Gliese 9189 and HIP 26394, interesting also because slightly larger and more massive than the Sun. In 2001 in that system a gas giant was identified that was named HD 39091b with a mass about 10 times Jupiter’s. According to some astronomers it could even be a brown dwarf rather than a planet and the growing interest for this type of object could lead to follow-up studies on HD 39091b as well. 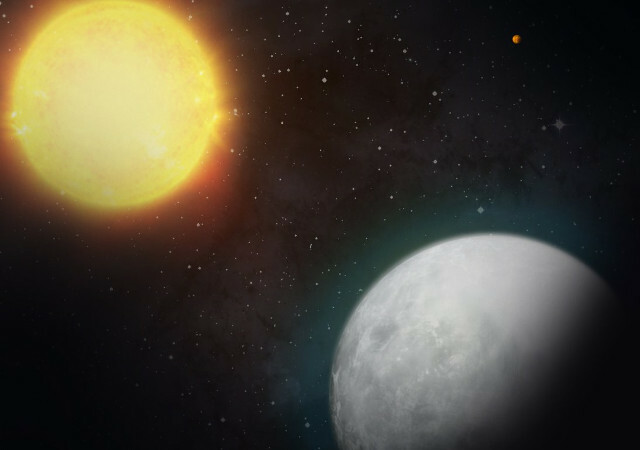 Chelsea Huang, first author of the research on the exoplanet HD 39091c, explained that from its calculated density her team deduced that it must have a rocky core. It could have an extended atmosphere of hydrogen and helium and a surface covered with water, a so-called ocean planet or water world. Its atmosphere could partially protect the surface from the strong heat coming from the star, which must be very close to have a year of only 6 Earth days, but if there’s still liquid water it’s evaporating. The atmosphere could be what prevents HD 39091c from being a lava planet, one with a surface completely or almost completely covered in lava. The configuration of the two known planets in the HD 39091 system is curious, in the sense that the gas giant has a very elliptical orbit that brings it into the system’s habitable zone and now the super-Earth has been found very close to its star. According to Chelsea Huang something happened in that system to get to that situation and new investigations will be needed to try to understand it better. Planet migrations are a developing research subject thanks to the fact that new systems are discovered all the time with planets that can be in strange positions and this case might represent a new interesting target for a follow-up study. More observations are scheduled for the TESS space telescope of the sky area that includes the HD 39091 system so the researchers can get more information about the new exoplanet. In this case, the fact that it’s so close to its star is an advantage because it means that it passes in front of it once every 6 days. The new data might confirm the astronomers’ deductions or offer some surprises, in any case the era of exoplanet hunting based on TESS observations has begun.